The Tussian, and Siemu tribes of Burkina Faso are small tribes which may share a common ancestry. Although they have developed cultural differences, they maintain a similar style in their representation of the buffalo helmets. There’s no getting around it. The numerous times I saw photos of the helmets shown below I sort of missed the mark. Once understood however the symbology serves to enhance the appreciation of the art. Another aspect of this is the quiet symbiotic relationship (read as tolerance) the egret, and buffalo share. In collecting African Tribal art the development of the appreciation for pieces (learning curve) is a driving force/component for expanding one’s collection. The main horns at the sides are a no-brainer, but the “stylized representation of a buffalo with a pair of curving horns projecting from a flat, rectangular head, a tubular body standing on four legs, and a vertically projecting tail” totally eluded me. The upright figures between the buffalo’s horns, on the tail, or the rear near the tail represent egrets, oxpeckers, or both. 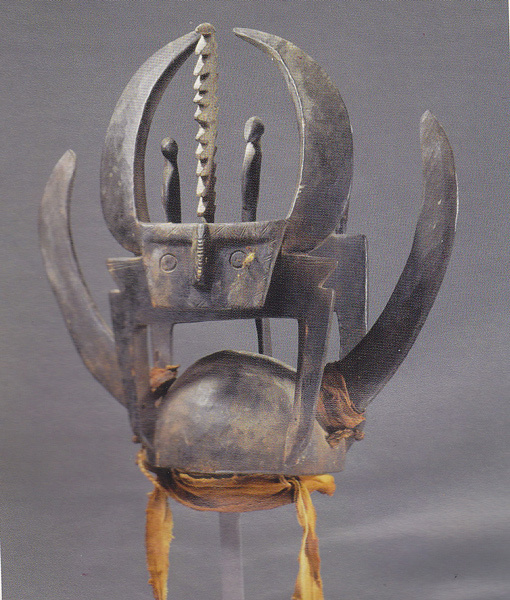 One notable difference with the helmet shown below is the absence of the two large curving horns which can be attached to the helmet with a fiber cord, or leather strips. Why the imagery, and representation of the buffalo? 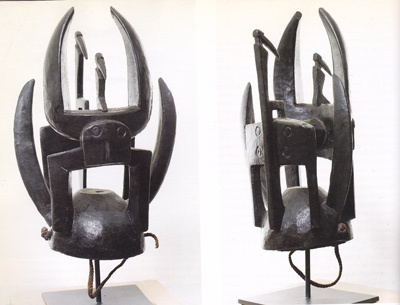 Buffalo Helmets of Tussian and Siemu Peoples of Burkina Faso. African Arts, Vol 41 #3, pg 26-43. I don’t know if anything hurts as much as having your heart set on grabbing a particular piece at an auction and then losing out. What makes it worse of course is being beaten down by an online entity while your’s truly is in the live audience. It’s the testosterone curse that seems to afflict men and women alike!! 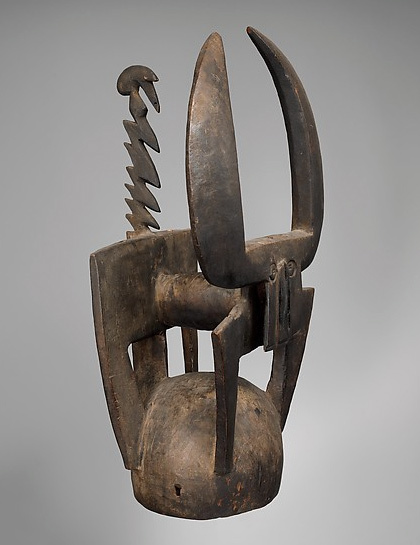 Collecting Tribal African Art has opened up a new world of “tentative obsessions”, where I started with Dan and Fang masks, moved through Yoruba and Kuba, and currently I remain fixated on Igala and Izzi (Igbo) pieces. This is not to say that I’m not moved by the occasional bout of “ikenga” or “firespitter” weakness, but one learns to control (arguably) spend at some point. Cue the Yoruba horseman. I absolutely had no intention of bidding on this piece, (especially since it was listed before the Ogbodo Enyi), but it is one of those pieces that show a well proportioned perspective that appealed to me. The problem is that if one does enough research, gets hung up on patinas enough, and clings to the altar of provenance, one is apt to miss out on appreciating certain pieces based on the simple criteria of their beauty or “presence”. The crazy thing about collecting African art, (or anything for that matter), is the inexhaustible thrill of both the hunt and the acquisition. The week ending 102211 was a good week simply because I finally managed to purchase a Baule monkey statue. “In Baule culture, cupbearing monkey statues, commonly known as “gbekre” since their first mention in 1900 by Maurice Delafosse, belong to the category of amwin, or “objects of power”. They were used by men-only initiation societies for a number of purposes, both functional – as a basis for prophylactic practices, linked to agrarian rites or to a form of divination known as mbra (Bouloré in RMN, 2000: 107 et Vogel, 1997: 221-230) – and iconographic, each type being designated by a specific term (aboya, mbotumbo, ndyadan, gbekre…) ” Sotheby’s. I can only say that I’ve been looking for a decent one for a long time. Typically the “Mbra” has elongated lower jaws and a very aggressive appearance, but as I’ve found in collecting African tribal art, the 80/20 adage holds quite well. 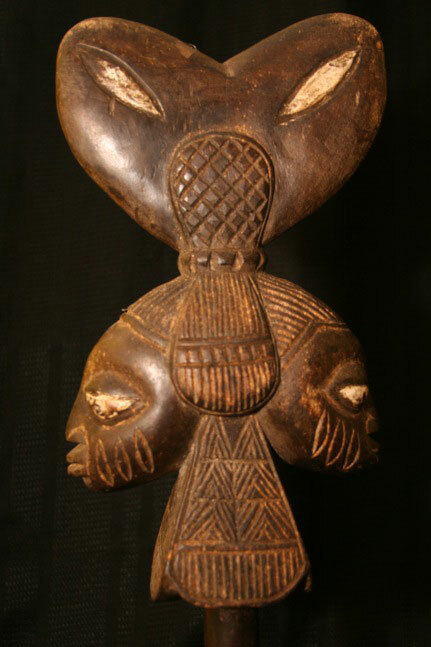 “The Mbotumbo (Ape god of the Baule), is the person’s special protector, but cannot be purchased in the market (like the Ibo do with their Ikenga), since certain conditions (eg. supernatural signs), must be observed.” This piece is a real twist on the more familiar Baule masks which typically promote harmony, and happiness, (Mblo, Goli masks). As luck would have it, I purchased a couple other items in the lot as well. 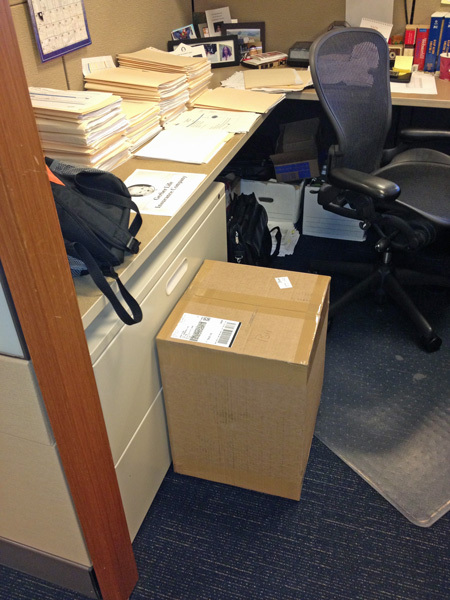 One item shown below was new to me. What I did recognize however was the shape of the “coiffure” or hair-cut, which seemed very similar to those of the Kuba masks, used in Kuba creation masquerades. The Kuba live in the Democratic Republic of the Congo. Using this information I was able to finally “track”, and identify the piece using the reference The Tribal Arts of Africa. 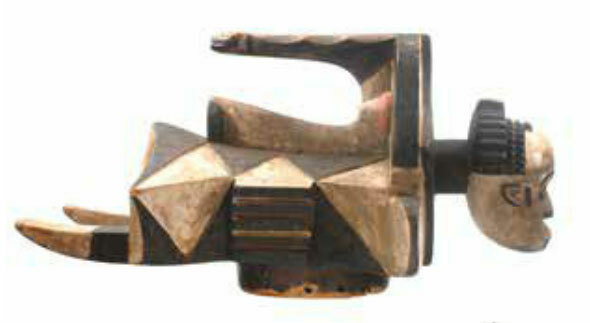 2) the scarification on the figure is very extensive. In collecting tribal African art one eventually stumbles across the huge diversity and complexity of the Nigerian genre. The use of Scarification intersects religious, cultural, social, aesthetic, and legal boundaries. The charts below show Nigerian scarification patterns and their associated locales. Scarification marks are also commonly used with tribal masks and statues. For example, the cult of Shango started in Oyo-Ile. The marks shown on the Shango dance wand are the marks of “the older line of Bashorun” in Oyo and are called meta aagberi (Abraham 1958:300). Yoruba – Sculpture of West Africa. Fagg et al, p 74. 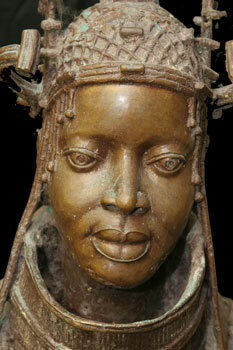 Yoruba – Sculpture of West Africa. Fagg et al, p 88.